In this paper, we propose an environment emulator based on the Deep Neural Network to predict the changed environment by the power consumption. The heater emulator and environmental parameters are components of the environment where the heater emulator consumes the power to change the environmental parameters. The Deep Neural Network based prediction model is trained using a dataset of an individual occupant which involves indoor and outdoor environmental data, and power consumption for the heater. Through the proposed environmental emulator, expected outcomes of heterogeneous control models can be tested in the indoor environment. In the building, the heating systems use the largest energy consumption in many countries. The residential buildings install the programmable thermostat that can be used by users to specify the desired environment through setting setpoints. Based on the sensing data for each environment parameter, the thermostat operates actuators including the heating, ventilation, and air conditioning (HVAC) infrastructure to change the indoor environment for the user desired setpoint . Most HVAC systems are controlled by the management station that actuates the system manually using the operating unit located in the room where the user wants to change the environment parameters through turning the system on or off, or setting the desired temperature setpoint . For the automatic control based on the intelligent decision making, the prediction models enable to infer the desired parameters using the individual data. For the awareness of the environmental trends in the indoor environment, the prediction approaches are used for predicting various parameters using the historical dataset including individual indoor parameters. Through the prediction model, not only the future data can be predicted but also the parameters at the same time with the inputs can be predicted. Based on the collected individual indoor environmental data with user states, the prediction model can predict the user desired comfortable environment . The individual comfort index can be referred by the decision support system to suggest a power parameter for operating the actuators by the power controller . Through the prediction model, the actuators enable to verify the expected outcomes with different conditions . The verification approach is a data-driven model that is built by a large set of data. In this paper, we propose an environment emulator based on the Deep Neural Network (DNN) to predict the changed environment by the power consumption. The proposed environment emulator is comprised of the heater emulator with environmental parameters. The DNN of the heater emulator is trained using indoor and outdoor environmental parameters, and heater power consumption. The training data is collected for an individual occupant who consumes energy to keep the indoor environment . Through the inputs to the emulator, the prediction model infers the indoor environment while consuming the power with an environment. Rest of the paper is structured as follows, Section 2 introduces the proposed environment emulator based on the prediction model. Finally, we conclude this paper in Section 3. Fig.1 illustrates the architecture of heater emulator using DNN based prediction model. The environment is comprised of indoor and outdoor environmental parameters which are affected by the heater emulator through power consumption. The power consumption can be generated by the power controller which may be operated by the decision-making system. The heater power parameter and environmental parameters are the inputs of the heater emulator that infer the new environmental parameters through the DNN based prediction model. For training the DNN learning model, the neural network is comprised of 5 input dimensions, 2 output dimensions, 5 hidden layers, and 30 dimensions of each hidden layer. Fig. 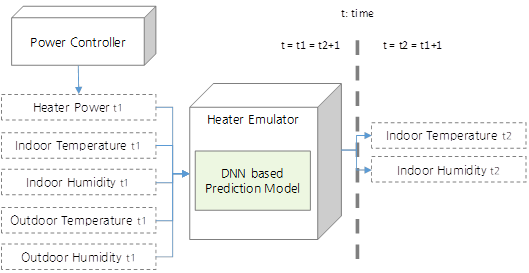 1 Architecture of heater emulator using DNN based prediction model. In order to provide an indoor environment for testing the expected environmental parameters including user comfort, various emulators are required to apply the parameters as the inputs . For this purpose, we presented an environment emulator based on the prediction model to predict the changed environment by the power consumption. The heater emulator and environmental parameters are components of the environment where the heater emulator consumes the power to change the environmental parameters. Through the proposed model, using the temperature and humidity of an indoor and outdoor environment with the expected power consumption can infer the temperature and humidity in the changed indoor environment. This work was supported by Institute for Information & communications Technology Promotion (IITP) grant funded by the Korea government (MSIT) (No.2017-0-00756, Development of interoperability and management technology of IoT system with heterogeneous ID mechanism), and this paper was performed for the Development of Radar Payload Technologies for Compact Satellite in Korea Aerospace Research Institute, funded by the Ministry of Science and ICT.)). Any correspondence related to this paper should be addressed to Dohyeun Kim. Fu, Yong, et al. "Thermal modeling for a HVAC controlled real-life auditorium." Distributed Computing Systems (ICDCS), 2014 IEEE 34th International Conference on. IEEE, 2014. Ferreira, Pedro M., et al. "Neural network PMV estimation for model-based predictive control of HVAC systems." Neural Networks (IJCNN), The 2012 International Joint Conference on. IEEE, 2012. Chang, Kuei-Chung, et al. "Using Deep Learning Approaches to Predict Indoor Thermal and Outdoor Rainfall Probability by Embedded Weather Box." 2018 IEEE International Conference on Consumer Electronics-Taiwan (ICCE-TW). IEEE, 2018. Farhan, Asma Ahmad, et al. "Predicting individual thermal comfort using machine learning algorithms." Automation Science and Engineering (CASE), 2015 IEEE International Conference on. IEEE, 2015. Ellis, Carl, Mike Hazas, and James Scott. "Matchstick: A room-to-room thermal model for predicting indoor temperature from wireless sensor data." Proceedings of the 12th international conference on Information processing in sensor networks. ACM, 2013. Long-term energy/environment data for ORNL Research House #3; https://openei.org/datasets/dataset/ornl-research-house-3, (accessed on 1 July 2018). Ali, Safdar, and Do-Hyeun Kim. "Effective and comfortable power control model using Kalman filter for building energy management." Wireless personal communications 73.4 (2013): 1439-1453.